Looking For Budget Friendly Storage? In today’s economy everyone is managing a budget. That’s why it’s important to find a company that understands the importance of saving money. Not only do we understand budgeting and saving money but here at Spaces we think it just makes good sense. Why spend more for storage than you did for the items you are putting in? We provide the highest quality low cost storage in the Kingston and surrounding areas. When you store your belongings with Spaces you know you are getting a secure, durable portable storage solution. No one wants to do business with a storage or moving company that cuts corners. 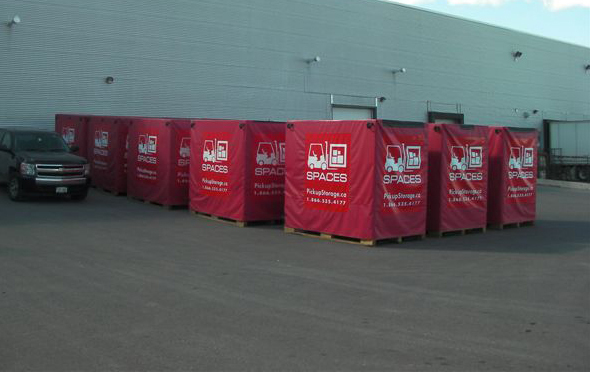 At Spaces Storage our containers are made with a durable wood frame and specially designed aluminum skid panels. It also comes complete with a light-weight secure steel door. All containers are supplied with a custom designed vinyl tarp to ensure your goods are well protected from the elements. • Pack At Our Warehouse – If you bring your items to us and pack your vault here you will save in the cost of delivery. Remember our delivery is only paid twice not four times. Meaning you are charged once when we drop off the vaults, we then pick them up for free and return them to our facility. You are charged again when you want them delivered back to you but we will return them to our location from your property for free. So even though we make four trips we only charge for two! • Special Pricing – If you order more than two vaults you will save $10 on every vault you order there after. • Only Pay for What You Use – We will only charge you for the vaults you use. Meaning if you order 3 vaults but only fill 2 you will only be charged for the 2. We will remove the third vault at no extra charge.